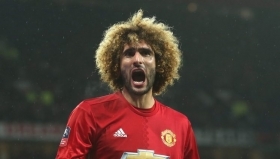 Monaco have reportedly registered an interest in securing the signature of midfielder Marouane Fellaini, who has been deemed surplus to requirements at Manchester United. The Principality oufit have already signed Cesc Fabregas from Chelsea to bolster their midfield this month and it appears that Thierry Henry is keen on strengthening the squad further to enhance the club's survival hopes. According to RMC, the former Arsenal man has made contact regarding the possibility of signing Fellaini with whom he has previously worked with the Belgian national team. Fellaini is currently sidelined for at least a month with a calf problem but it is indicated that United would be happy to sanction his sale with Ole Gunnar Solskjaer not regarding him as part of his plans for the season. Monaco are likely to propose a short-term loan for the Belgian with the obligation to buy when the campaign comes to a close. The midfielder has made just six league starts this season.